What Is So Special or Powerful About Excel? A lot of times I get asked if Excel is special or powerful enough to worth my limiting myself to just it. "Why don't you expand to taking on the entire Microsoft Office suite?" "Learn Microsoft Project or SharePoint and not limit yourself to Excel only." The truth is that they are right. It's always better to know the entire Office suite than knowing just one of the software in the suite. And being a guru in Microsoft Project or SharePoint also will increase my earning potential. But the one thing most people do not know is that Microsoft Excel is so special and powerful that I can't know all about it and it's definitely worth all my professional time. I can build a complete software with it. I have helped a US stock analyst enhance his stock analysis program with Excel VBA. I have done data cleaning using Excel for Supermart and Guinness. I have had multiple dealings based solely on Microsoft Excel with Nigerian Breweries. I have made Excel based analysis tools indirectly used by 3 of the 4 mobile telecoms companies in Nigeria. I have done Excel jobs for clients in USA, UK and France. And there are others I can't mention. From my experience, the bigger the company the more intensely they use Excel. I don't know of any big company that does not use Excel for its financial reporting and budgeting. There is no company that has SAP, Siebel, SAGE or Dynamics and doesn't still export data from there into Excel for further analysis and reporting. There is no CFO who is not expected to be an Excel super user. 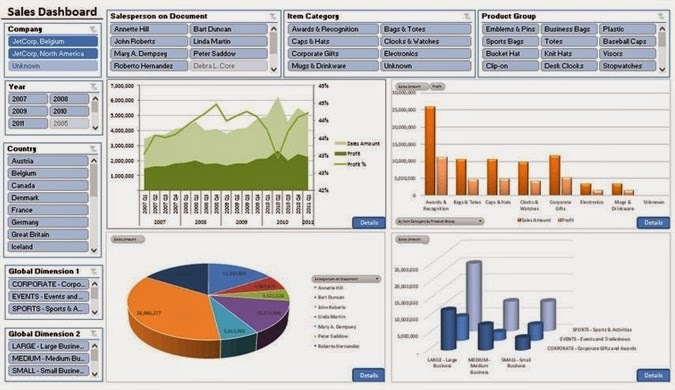 Even multinational companies have most of their performance analysis reports, scorecards and dashboards in Excel. I have seen companies (and worked with a few) who run their projects management in Excel rather than in Microsoft Project. One of my friend who lived for some time with a friend who works full-time at UN HQ said he worked mostly on giant Excel files. When I go marketing my service, the people I have trouble explaining my services to are people who work in small organizations, they can't visualize anything I'm telling them. The most they've used Excel for is to view Excel files that were sent to them. But those working with big multinationals easily grasp what I'm saying and even talk of their company having to fly in someone from outside Nigeria to fix some Excel template/programs. I know people whose full-time job is Microsoft Excel consulting. And a couple of them have been doing it for over 15 years. That's how special and powerful Excel is that people will focus on just it for over 15 years as all they do. I wrote some of them and they shared their experience with me of how they began, get jobs/projects and charge. Most charge over $180 per hour. They don't have fancy websites and they do very little marketing. A lot of them run their business as a solo entrepreneur. Their is a steady corporate demand for their expertise such that a lot of them quit their day job to start an independent Excel consulting business. People above 50 years old who are doing just Microsoft Excel. And now the world is becoming crazy about data. There is the huge interest in big data analysis and data visualization. I am constantly having to work on data that is in Gigabytes and have millions of records. Before Excel 2013, I had to use Access and a file splitter. Now with PowerPivot and a 64-bit Excel 2013 I can conveniently handle huge datasets. I tried learning R and had to abandon it when I discovered that it couldn't handle very large files (2GB and above); files Access and PowerPivot could easily work on for me. The more interesting part is that Excel can now connect to big data infrastructure (like Hadoop based HDInsight) and work on multiple data sources at once (building a data model). Excel can now do video-like visualizations (storytelling) and map-based visualizations. You can now not only show how your company sales is doing by state but also show it on a live map that is much more interactive and zoom-able. For me, Excel is powerful enough to focus on. The only issue I have with it is that I can't make web applications with it. So I'm currently learning ASP.Net MVC, AngularJS and Web API. It's 10 Days to 2015. My 2014 Lessons. Fear Is Good. Very Good.